Extravagant in every way, the African tulip tree (Spathodea campanulata) is known throughout the world as one of the most beautiful of all flowering trees. Widely grown in tropical climates but sensitive to cold, it was once quite rare in cultivation in California. 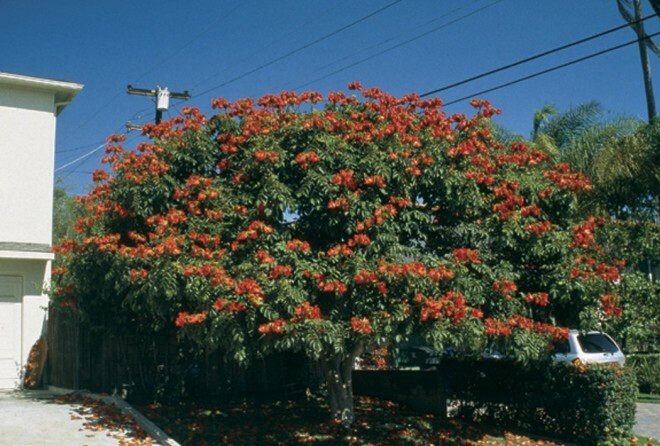 In the past twenty years, however, this “king of flowering trees” has become a popular landscape tree in frost-free areas of Southern California, with a number of fine, mature specimens now thriving in San Diego County. Native to tropical Africa, the African tulip tree is a member of the bignonia or trumpet vine plant family (Bignoniaceae). It is both horticulturally and botanically distinct, being the only species in its genus. In its native habitat (centering around Lake Victoria) and as a cultivated ornamental in tropical climates, it is a large evergreen tree to fifty feet tall, or more, with flowers throughout the year. When grown in cooler climates such as Southern California, however, it is usually smaller (to around twenty-five to thirty-five feet tall and fifteen to twenty-five feet wide), and may act as a deciduous tree, losing its leaves during winter and early spring. The tropical-looking foliage of the African tulip tree is composed of eighteen-inch-long, pinnately compound leaves with seven to nineteen oval leaflets, each four to six inches long. New leaves emerge a bronzy color, becoming dark green above and paler beneath. Flowering is both conspicuous and dramatic, with football-sized flower clusters produced at the ends of every branch during warm weather. These unusual flower clusters are composed of many velvety brown claw-like buds that split open vertically as the five-inch-long, broadly trumpet-shaped flowers emerge in succession. Fully expanded, the mature flowers are elaborately scalloped and picoteed, and the flower color is typically an intense red orange (there is also a golden yellow-flowered selection that is popular in cultivation). As many children raised in the tropics know, the blossoms of the African tulip tree are not only pretty but entertaining. Every flower bud is pressurized with a watery nectar as it expands; if you squeeze the buds just right, they make an effective water pistol that can be accurate up to ten feet away. As a bonus, the frilly flowers, when fully open, make colorful hanky-like pocket ornaments (which can be a nice conversation piece at a summer or fall horticultural society gathering). The African tulip tree grows to perfection in the cooler tropical climates of the world, where it is evergreen and ever-blooming; it has even naturalized in some areas, such as Hawaii. In Southern California, however, it tends to sulk in our cool wet winters, and displays its full glory only in summer and fall. Intolerant of much frost (especially as a young plant), it is nearly evergreen in our mildest coastal climates, but typically deciduous farther inland where winters are cooler. In our garden in San Marcos (northern San Diego County), ten miles from the ocean at 800 feet elevation (Sunset zone 23), we have a fifteen-year-old African tulip tree that is around twenty feet tall and fifteen feet wide. Because last winter was unusually warm and dry, our tree (which had been flowering since July of last year) stayed in full bloom and full leaf until February, when nighttime temperatures suddenly fell to 40° F. Although there were still many unopened flower buds, the flowers quickly got smaller and smaller, and, by March, the tree had dropped its leaves. We had a cool, wet March, and, as I write this in mid-April, our tree remains completely dormant. Given some warmer weather, however, I know that it will have leafed out by June and be flowering again in July, when it can, once more, merit the attention of all visitors and continue its reign through the late summer and fall months—and perhaps beyond. Proper siting to get the most out of your African tulip tree means a warm, preferably south-facing slope with full sun and good drainage (and, hopefully, no frost). Trees planted on the south side of buildings benefit greatly from the extra winter warmth. Remember that, for tropical trees, soil temperature can be even more important than air temperature. That’s why a south-facing slope works well. Good drainage is also important, since cold wet soils can often do more damage to a tropical tree than cold air alone. 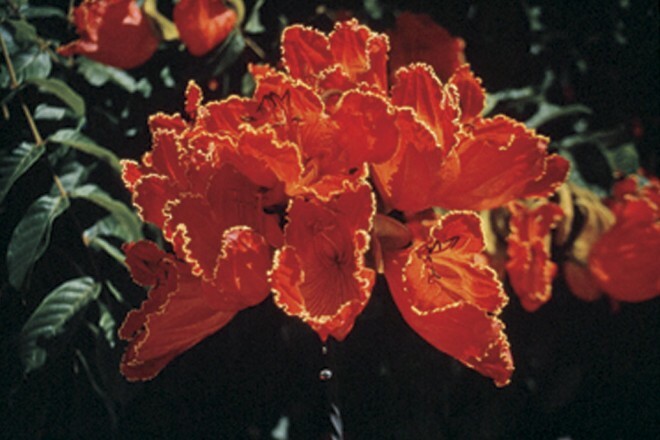 Not too long ago, there were only a few mature specimens of the African tulip tree in all of Southern California, and it was extremely rare in the nursery trade. Now, there are many trees to be seen, including some in freeway plantings, and it is more widely available (though still not common) in nurseries. Is this because there has been less frost here in recent years, allowing many young plants to mature, or were we simply the first generation to attempt to grow this tree extensively? Whichever is true, if you live in frost-free Southern California these days, you can and should enjoy this “king of flowering trees” in your garden! Adapted with permission from Ornamental Trees for Mediterranean Climates: The Trees of San Diego, published in 2006 by the San Diego Horticultural Society.